LEGO Clock Radio Disappoints | OhGizmo! There’s been a lot of LEGO this and LEGO that on OhGizmo! recently, and instead of giving you a break, I figured I’d just keep it coming. I mean is there anyone on Earth who actually dislikes LEGO? 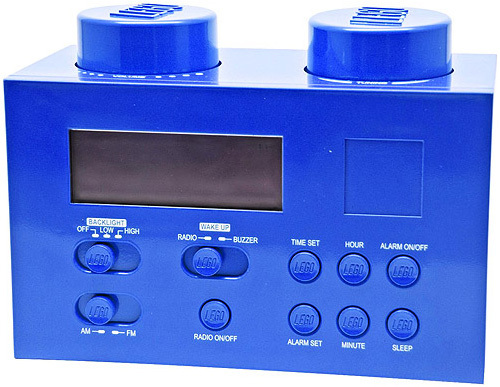 The obvious answer is no, but I have to say I’m less than impressed with this official LEGO clock radio. Sure it’s got the LEGO logo plastered everywhere, and a couple of giant knobs on top that serve as volume and tuner dials, but it appears to be completely incompatible with actual LEGO bricks. I mean the top of the radio couldn’t have been made brick-friendly so that ‘kids’ could accessorize and personalize it with their own LEGO creations? I’m all for the company branching out with gadgets like this, but LEGO isn’t about the brand name, it’s about the building blocks! $29.97 from Walmart. At least its flat friendly so you can superglue the flat Lego base pieces to it.